Tasty tilapia freshly caught from the Ruvu River in Tanzania, but this globally-cultured Nile Tilapia strain has been introduced from Uganda and is threatening unique native tilapia species.With world fish stocks dwindling, tilapia farming is a global success story, with production tripling this millennium. This is now a $7.6bn industry, producing 4.5million tonnes of affordable high-quality fish every year. And it is sustainable, because unlike the salmon and sea bass we grow in Europe, tilapia don’t need to be fed lots of other fish caught from the oceans, but largely eat vegetable material and farmyard waste. 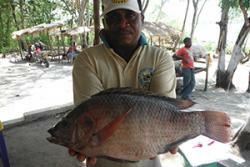 Although now cultured throughout the world, tilapia originally come from Africa. Globally only a few species and strains are cultured, but hundreds of unique wild populations, especially in Tanzania and Kenya, are likely to harbour priceless genetic diversity, with desirable traits such as fast growth, tolerance of extreme environments, peaceful temperaments or disease resistance. Unfortunately, in recent years, standard ‘pond culture’ tilapia stocks have been released into the wild all over Africa, where they compete with native strains, hybridise with them, or may bring exotic diseases. Professor George Turner of the University’s School of Biological Sciences will lead a team of researchers aiming to find remaining pure wild stocks in Tanzania and recommend how they can be preserved, including if necessary, by deep-freezing sperm and other cells. The team will also carry out large-scale full-genome sequencing to investigate the fate of native and exotic genes in places where they are hybridising. The work will be funded by a £250k grant from the Biotechnology & Biological Sciences Research Council and Natural Environment Research Council and involve researchers from the University of Bristol, the Genome Analysis Centre (TGAC) in Norwich, the World Fish Centre in Malaysia and the Tanzanian Fisheries Research Institute. The research will be for two years.